A suicide bombing killed at least 16 people, including two U.S. service members and two American civilians, in northern Syria on Wednesday, just a month after President Donald Trump declared that ISIS had been defeated and he was pulling out U.S. forces. Though ISIS has claimed credit for the attack, the terrorist network has not produced evidence to support that claim. The attack in the strategic northeastern town of Manbij highlighted the threat posed by ISIS despite Trump's claims. It could also complicate what had already become a messy withdrawal plan, with the president's senior advisers disagreeing with the decision and then offering an evolving timetable for the removal of the approximately 2,000 U.S. troops. The attack prompted new complaints about the withdrawal and underscored Pentagon assertions that ISIS is still a threat and capable of deadly attacks. Sen. Lindsey Graham, a Trump backer and prominent voice on foreign affairs on Capitol Hill, said during a committee hearing Wednesday he is concerned that Trump's withdrawal announcement had emboldened ISIS and created dangerous uncertainty for American allies. Rep. Elissa Slotkin, D-Mich., said the attack demonstrates the lethal capability of ISIS and "the fact that it happened in Manbij, probably the single most complicated area of Syria, demonstrates that the president clearly doesn't understand the complexity of the problem." 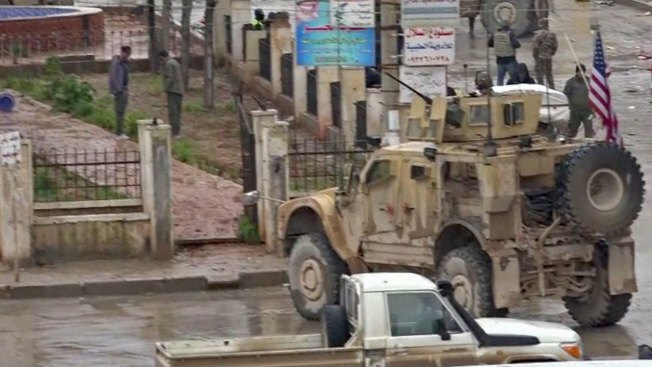 Manbij is the main town on the westernmost edge of Syrian territory held by the U.S.-backed Syrian Kurds, running along the border with Turkey. Mixed Kurdish-Arab Syrian forces liberated Manbij from ISIS in 2016 with help from the U.S.-led coalition.